What a lot of people don’t know about me is that although I am an East London girl born and bred, every summer for sixteen years, I would roam the fields of West country. My mother and her parents (hereafter known as nanasaab and nanabee) resided in Bristol. Every summer, I would leave the city of smoke for cobbled stones and neverending fields of green. There are two memories that are quintessential to my childhood: one is the Bristol Balloon Fiesta that’s held in August around the time of my birthday. Everyday I would be glued to the balcony of my nanasaab’s apartment watching hot air balloons float across the horizon. Every year I vow to go on one of those balloons, but every year I’ve failed. The other is taking long walks with my nanabee through Lawrence Hill to St. Paul’s market, stopping along the way every so often and collecting blackberries that grew around the abandoned rail tracks. She said it reminded her of kala jamun, a tiny black plum which you get in Bangladesh. We’d get home and my cousins would fire up the stove, char the garlic and crush the chili until their eyes watered. 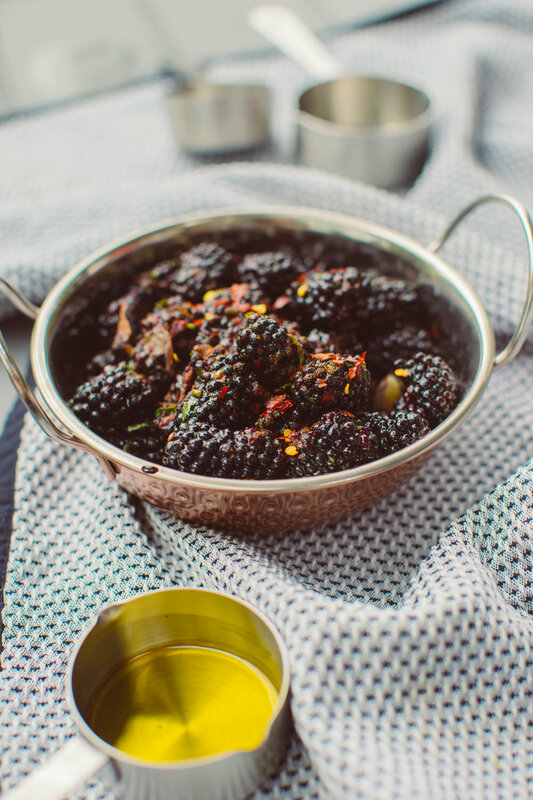 We’d forgo spoons and dig into baltis of blackberry bhorta with our bare hands. Neither my nanasaab or nanabee are with us anymore, but when my khalamoni and cousins come over, we pay a little homage to those bygone days of whiling away the time picking fruits with our grandparents. This is by no means an ‘authentic’ recipe as bhorta is usually made from mashed vegetables, not spiced fruit. I guess in the West, it would be classed as a chutney or a jam, but us, we know it as blackberry bhorta. Soak in water and a little apple cider vinegar to really get rid of the dirt and bacteria. You’ll be surprised at what comes out! 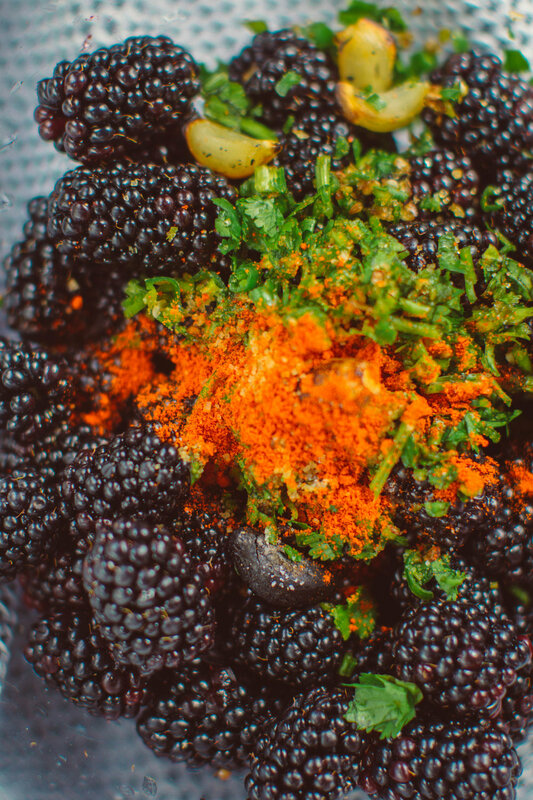 Mince green chili and coriander into a bowl, then drain and pour in the clean blackberries. Wrap a few cloves of garlic in tin foil, place on an open flame for 2-3 minutes until they char. Mash with the back of a knife and add to the bowl. Mix in salt, chili flakes, sugar (if needed), and serve immediately. Fruit bhorta is eaten on its own.